Recipes for Brick BBQs :: Seafood :: Marinated Shrimp. 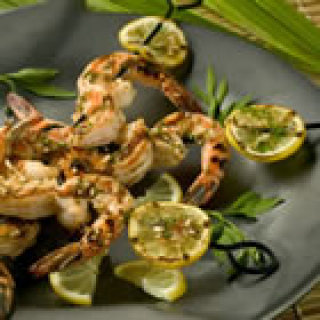 HomeRecipes for Brick BBQsSeafoodMarinated Shrimp. In a mixing bowl, mix together olive oil, parsley, lemon juice, hot sauce, garlic, tomato paste, oregano, salt, and black pepper. Reserve a small amount for basting later. Pour remaining marinade into a large resealable plastic bag with shrimp. Seal, and marinate in the refrigerator for 2 hours. Light your Black Knight barbecue and oil the grill. Thread shrimp onto skewers, piercing once near the tail and once near the head. Discard marinade. Lightly oil grill grate. Cook shrimp for 5 minutes per side, or until opaque, basting frequently with reserved marinade.